The Philippines is not only endowed with pristine beaches, islands, beautiful mountains and resorts, it is also bestowed with world-class water and amusement parks where you and your family can beat the heat or enjoy together despite a rainy season. #1 - Ocean Adventure (Subic Bay Freeport Zone): Boring days are over so have a whale of a time at Ocean Adventure, located in Camayan Wharf, West Ilanin Forest Area, in Luzon! Their uber friendly animals can’t wait to meet you and your company; therefore, greet their dolphins, sea lion, eagle, python and flying fox. On top of that, you can get the chance to swim with water creatures and take wonderful photos to bring home, along with the opportunity to view marine life via their top-notch aquariums. #2 - Ace Water Spa (Pasig): You can’t say no to the sterling fun awaiting you and your loved ones at Ace Water Spa, situated at United Street, Corner Brixton Street, Metro Manila, Luzon. If you got kids, they will definitely whoop it up in the kids’ area that has got a kiddies pool with mushroom falls and big water gun, alongside with the floor fountain, bucket splash and lazy river. What is more, adults get to revitalize their tired body in the hot herbal pools, cold pool, lapping pool as well as with the soothing massages available. #3 - Enchanted Kingdom (Santa Rosa): There’s magical fun for everyone at Enchanted Kingdom on San Lorenzo Road, beside Ciudad de San Jose, in Laguna, Luzon. Like Disneyland in America, you can make merry with exciting rides there, such as the jungle log, space shuttle, Ferris wheel, Rio Grande rapids, carousel etc. For the thrilling water activities, make sure to bring extra clothes to change to afterwards and also come early as this popular place gets really crowded especially on weekends and holidays. #4 - Gloria’s Fantasyland (Dapitan City): This amusement park is such a spectacular attraction in Mindanao with their grand night parade that starts at 930 p.m. Tuesdays until Sundays. Be mesmerized in total amazement of their thrilling rides (opens at 4 p.m.), fire and thunder show, festival of colors/parade of cultures and fireworks display – so stunning you will also feel as if you were in Disneyland! So come, bring your friends and family to celebrate your jubilee! 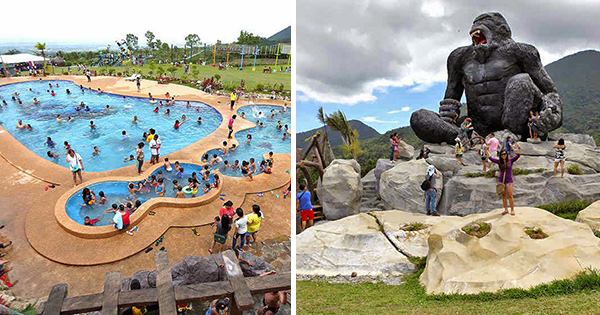 #5 - Dahilayan Forest Park (Valencia City): You and your loved ones ought to revel in Dahilayan Forest Park, found in Barangay Dahilayan, Manolo Fortich Bukidnon, in Mindanao. There are many reasons to be amused there such as the free playground with all sorts of enjoyable rides like playhouses, monkey bars, climbing walls, see saws and spinning disk to name a few. Believe it or not, they also have got other striking activities namely, forest putt mini golf, zorb, tree top adventure, forest luge, atv adventure, bungee bounce, etc. #6 - Campuestohan Highland Resort (Talisay): Are you looking for remarkable ways to have a good time? Then all you need to do is to come looking for Campuestohan Highland Resort, located in Barangay Cabatanga, Negros Occidental, in Visayas for captivating moments! Have a ball with their amazing rides like the zip line, rope course, sky bicycle, horseback riding, hamster wheel, grand carousel, mini train, chair lift (coming soon), wave pool (coming soon), and many more to adore!